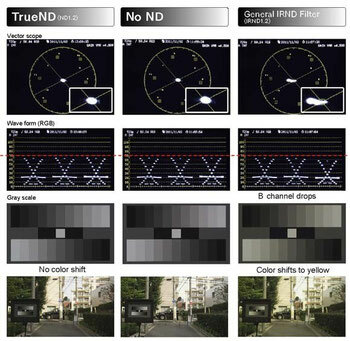 TrueND is the Neutral Density filter solution of the Digital Cinema Camera era. This metallic alloy film coated clear glass filters, made under strict quality control, offer you accurate transmittance, true neutral image free from infrared contamination (up to 750nm). When we talk about neutral we mean equal transmittance troughout the visible spectrum (reaching from 380nm up to 750nm). The graph underneath illustrates the relation between transmittance and (visible) wavelengths from three TrueND filters. If the line accros the graph starts rising from 650nm and up, it means that the filter is transmitting more (near) infrared wavelengths which will result into color shifting in the red direction. When the line rises in a specific area, such as between 450 and 500nm the filter would pass through more blue colour than other colours, resulting in a colour shift in the blue direction in the recorded image. In other words, filters that colour shift do not have straight line of transmission throughout the visible spectrum. 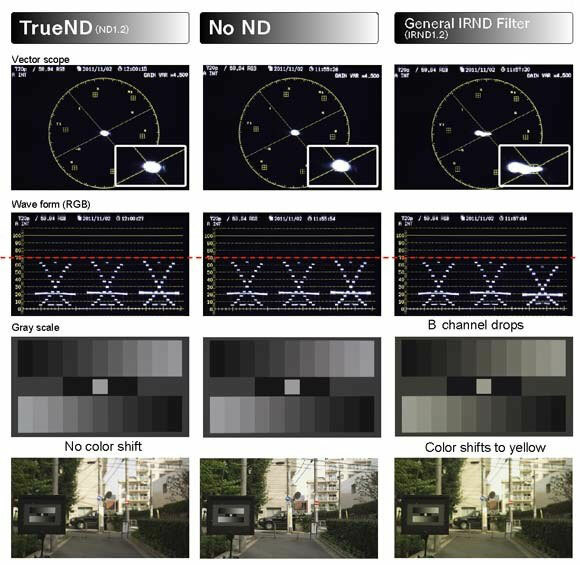 As you can see, TrueND simply stands for how ND filters are supposed to be. These filters work very well in combination with all types of camera's from the different manufacturers. This makes them ideal rental items since you do not need multiple IR filter solutions on the shelf and no need to make white balance presets in camera.